I don’t know if you have ever had a Costco Chocolate Muffin before but they are so delicious and they’re huge! The “secret” ingredient for their muffins is really just cake mix! So much for thinking they were nutritious, huh? I always thought they were too delicious to really be a breakfast food. My kids enjoy these muffins and I will be making more varieties soon! I’m thinking blueberry and cinnamon struesel! When I made these muffins I filled them almost full. If you want muffins with the huge muffin tops I would suggest to only make about 6 muffins and fill the liners a little more to achieve the muffin top you desire. These muffins came out really well and I think next time I make them I may double my batch and have larger and more muffins! It’s not even 24 hours later and these muffins are gone! They’re that good! When these Jumbo Chocolate Chunk Muffins came out of the oven my house filled with the smell of chocolate. It was so wonderful and my son couldn’t wait to try one. The chocolate chunks melting into the muffin only made the wait even harder for him! Overall, I was very pleased with the way these muffins turned out and everyone in the house really enjoyed them. Every bite had a chocolate chunk it had the great texture of a muffin. I call them a success! I’d say my family thinks so, too! Looking for cupcake recipes? Check these out! These muffins are inspired by Costco bakery muffins. 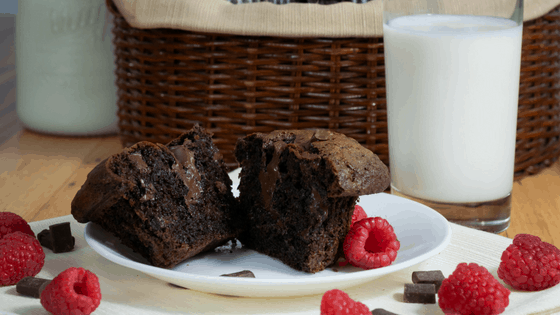 With a chocolate chunk in every bite, these muffins are full of flavor and full of chocolate. Line jumbo muffin tins with liners. Combine melted butter, eggs, milk, and baking powder in large mixing bowl. Add in chocolate cake mix, stir until blended. Stir in chocolate chunks, just until mixed. Fill liners 3/4 way full or fuller for less muffins but higher muffin top (will get less muffins this way). Bake for about 20 minutes. Check muffin with toothpick. They are done with muffins come out clean - do not over bake. They will become dry. Remove from muffin tins to remove from heat. Tip: To achieve a fuller muffin fill liners all the way. Tip: Resist the temptation to open the oven while the muffins are rising. It will cause the muffins to fall. OMGEEE – I’ve had a jumbo chocolate chunk muffin from Costco before and wow – yours sounds so good! Put me alone in a room with a tray of these and they’d be gone in 0-60 seconds – no lie! this recipe sound wonderful these look irresistible. I love chocolate muffins! I was explaining to the fella how awesome the chocolate Costco muffins were when you warmed them up and ate them with a glass of milk. This recipe looks like a killer copycat. Love it! Yum! The bigger the better when it comes to chocolate muffins I say! These look perfect. OMGEEEE I love Costco’s chocolate muffins! I must try this recipe your picture looks great! Dana, I love that the recipe doesn’t require a bunch ingredients! I LOVE chocolate. I can not wait to make these and watch them go quickly because the kids have eaten them all. A wow they look yummy! I could do with one right now!